It's probably rather late to be drinking it and certainly a Tuesday night might not be everyone's idea of the perfect time to drink a 9% beer but feck it, It was well past time so I cracked it open last night. 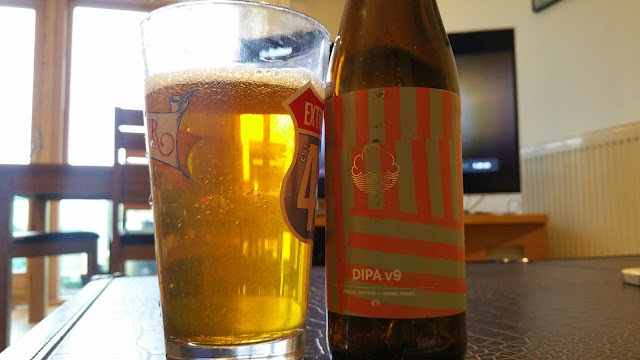 Cloudwater release a different version of their DIPA each month. Version 9 was from November 2016 and was an absolute cracker. It's a full on juicy DIPA packed full of orange and lemon and more subtle mango and other tropical fruits. There was one weird thing that I wasn't sure of. Every now and again I got a Hall's Soothers lozenge thing going on. I decided there was some sort of menthol note coming through, presumably from one of the many types of hops. I went back and forth and decided in the end that I like the subtle menthol. Lovely beer, I wonder what it was like fresh? OK hands up, who's collecting each batch? Surely someone is keeping them for a vertical tasting in the future. Thanks to Steve Lamond for giving me the bottle and apologies for taking so long. It's a real 1st world problem to have too much beer to get through and too many events to go to.